My dear friend and business partner and I are teaching a class on vegetarian cooking, and for the class we wanted to share a recipe for roasted chickpeas. Roasted chickpeas are super easy to make and are a great snack all on their own. They are satisfying, crunchy, and they can be flavored a bunch of different ways. Roasted chickpeas are a crowd pleaser, and great for kids, but we also wanted to find a way to incorporate them into another dish. My sister in law found this Melissa Clark recipe and made it for an outdoor BBQ the other weekend. I fell in love with this salad, and I knew that I had to put it into my salad repertoire ASAP. Yes, I'm posting two salad recipes in a row... but this salad is more of a meal than a salad. It's addictive and has one of the best dressings ever. It's one of those salads that really surprises you with how good it actually tastes. I've adapted the recipe slightly to fit my own preferences. I'm using plain whole milk yogurt instead of Greek; I find it creamier and smoother. I also added a generous amount of za'atar to my dressing. Za'atar is a generic name for a family of Middle Eastern herbs, and it is also the name of a common spice mixture frequently used in the Middle East. The spice mix usually involves some combo of ground thyme, oregano, marjoram and sesame seeds. If you can't find za'atar you can substitute any type of herb (dried or fresh) that you like. Dill or parsley would be nice here. A mix of ground thyme and oregano would be good, too. You can also just omit the herbs entirely; the dressing is good with just the yogurt, oil, lemon juice and garlic. If you are using canned chickpeas, start by rinsing and draining the the chickpeas. If you are starting with dried chickpeas, soak them in cold water overnight or for at least 8 hours. Drain them then add them to a pot, and fill the pot with water (at least 4 cups of water for every 1 cup of chickpeas). Let the chickpeas and water come up to a boil then simmer until the chickpeas are tender and fully cooked. Timing varies depending on the chickpea, but if they are presoaked the chickpeas should cook in about an hour and a half. Spread the chickpeas in an even layer over clean kitchen towel or over paper towels. Pat the chickpeas dry. Transfer the dried chickpeas to a sheet pan and add the the spice, salt, pepper and oil to the chickpeas. Toss until the chickpeas are evenly coated in oil. Roast the chickpeas for 30-40 minutes or until golden brown and crispy. If you are making these chickpeas for the salad recipe below, you can roast them at the same time that you roast the sweet potatoes. In a small bowl or mason jar, combine the ingredients for the dressing. Whisk the ingredients together or shake the jar until they are fully incorporated. Add the dressing to the salad and lightly toss everything together until all of the ingredients are well coated. The salad can be dressed up to 1 hour before serving. Peel and cube the sweet potatoes into 1-inch pieces. Place the cubed sweet potato onto a baking sheet and drizzle with oil (about 2-3 tablespoons). Season with a pinch of salt and freshly ground pepper. Roast the sweet potatoes for 25-30 minutes or until browned, tender and cooked through. The sweet potatoes can be made at the same time as you roast the chickpeas. Once cooked, allow the sweet potatoes to cool slightly. Add the spinach to a large salad bowl. To the spinach add the cooled roasted chickpeas and sweet potatoes. Top with sliced green onion. It was an unusually hot spring day here in Los Angeles and we were going to have a BBQ birthday celebration outside for my lovely sister in law. I wanted to bring a light and flavorful dish to go with all the grilled heavy things, and I went off to the market with only the idea to get ingredients for some kind of salad. At the farmers' market I picked up beautiful California avocados and a big bunch of cilantro (thank you California for all of your avocados!) I stopped at a grocery store for a few extra things and I saw some really perfectly ripe mangoes. Mangoes and avocados always go so nicely together and they are two of my favorite fruits forever and always. That's when I knew what salad I wanted to make. I decided to pick up some spinach. I wanted a green that would hold up a little to the warm day and the substantial mango and avocado. Butter lettuce or even thinly sliced Napa cabbage would go well in this salad too. I made a gingery Asian-inspired dressing. These ingredients can hold up to a lot of flavor and the mango, avocado and cilantro go really well with ginger, lime, rice wine vinegar and sesame oil flavors. You don't need all of the ingredients listed, but I do think this type of dressing works better than a more classic French or Mediterranean vinaigrette. Like all salads this one is infinitely interchangeable depending on your preferences. The stars of this show are creamy avocado and tangy sweet mango... the rest is up to you. Add the spinach to a serving dish. Pile the other salad ingredients on top of the spinach. Gently toss the salad with the dressing, be careful not to break up the avocado too much. Add as much dressing as you need to lightly coat all of the vegetables. You may have excess salad dressing depending on how heavily or lightly you like your salad dressed. *Mirin is a sweet rice wine with very low alcohol content that is often used in Japanese cooking. You can usually find it in grocery stores next to the rice vinegar and soy sauce. I like having it on hand because it adds a really nice bright sweetness. It's totally optional here and shouldn't require a special trip to the store. When I was 10 years old I lived in Jerusalem for a year with my family. While we lived there we ate a LOT of chicken schnitzel (schnitzel is also made from veal, and can be made from any boneless meat that is thinly pounded out). It may not be common knowledge, but schnitzel is one of the most popular dishes in Israel and it is widely served in restaurants, cooked fresh at home, or sold frozen in grocery stores. I really haven't eaten often since then. But we had been talking about making all winter... The we in this party lived in Berlin for a significant amount of time. During part of that time he lived above a restaurant that specialized in schnitzel, and for that and other reasons has a strong affinity for the dish. Somehow schnitzel-making kept getting postponed... either we didn't feel like something fried, or we didn't feel like meat, or we just didn't feel like schnitzel. 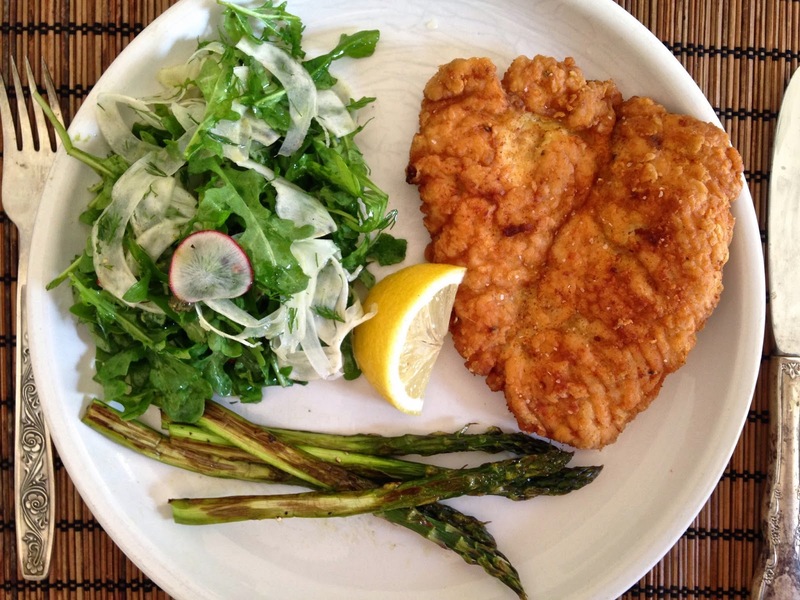 One recent spring day schnitzel finally seemed like the perfect thing to eat for lunch. I had picked up some beautiful asparagus, a really nice fennel bulb, and some arugula. I roasted the asparagus simply: with olive oil salt and pepper at 400°F until tender and just browned. I sliced the fennel super thin on a mandolin; I did the same to the radish and I added them to a pile of wild arugula all tossed together with a lemon vinaigrette. In Israel I always ate schnitzel plain or with ketchup, but in Germany it is apparently often served with cranberry sauce. This was an exciting discovery for me as I love any excuse to make and eat cranberry sauce, and I always keep a bag of frozen cranberries in my freezer for just this reason. 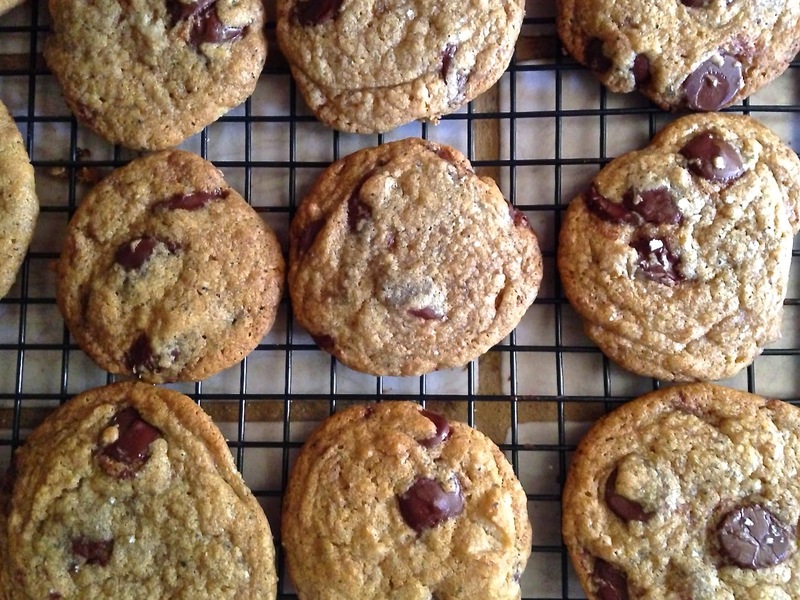 I made a batch and served it along with everything else. Even though the schnitzel is essentially fried chicken it isn't all that heavy. The thinness of the meat allows for a kind of light crispyness that is satisfying without being a gut bomb. It goes perfectly with a side that is fresh, green and slightly acidic. I was in Berlin once. It was June and the weather was perfectly sunny and warm. The daylight lasted forever and everywhere Berliners were out and about enjoying the early summer days and nights. One perfect afternoon, I went out to lunch with my dear friend. We drank cool rosé, and he ordered the schnitzel with white asparagus. I ordered something less memorable and gratefully accepted his offer to share his plate of food. Maybe schnitzel is always linked with asparagus for me for that reason... maybe its more linked to that day in Berlin than that year in Israel. Regardless, this plate of food makes me think of spring or early summer when everything is vibrant and new beginnings are on the horizon. Using a meat mallet, rolling pin, or the bottom of a cast iron skillet, pound the chicken breasts until they are about 1/8-1/4-inch in thickness. Make sure each piece of chicken is pounded out to the same thickness. Also make sure to pound out the chicken as evenly as possible (so that parts of it aren't thicker than others, otherwise one end could get dry/burnt while the other is undercooked). Beat the eggs in a deep shallow bowl. Season with salt and pepper. Add the flour to another deep shallow bowl. Season it with a generous pinch of salt and freshly ground pepper. In a large cast iron skillet or heavy-bottomed pan, add a 1/2-inch layer of oil. Heat the oil over medium-high heat until it is hot (make sure that it is bubbly and really hot, not luke warm or semi-hot). Dip the chicken breast one at a time into the eggs first. Shake off any excess egg. Next, dip the chicken into the flour. Shake off any excess flour. Place the coated chicken breast into the hot oil. Repeat with a second chicken breast. Depending on the size of the pan, cook 2 chicken breasts at a time. Be careful not to overcrowd the pan. Cook for 4-5 minutes per side, or until the chicken is golden brown and fully cooked. Make sure the oil stays hot but not super hot. You may have to raise and lower the heat on the stovetop periodically as the schnitzel cooks. Once evenly browned on both sides and cooked through, transfer the schnitzel to a rack and continue the process until all of the chicken is cooked. Serve immediately with lemon wedges and cranberry sauce if desired. Place all of the ingredients into a saucepan or pot. Bring to a boil. Simmer for 10 minutes. Remove from stove, allow to cool, transfer to a bowl and refrigerate. The sauce will thicken as it cools. 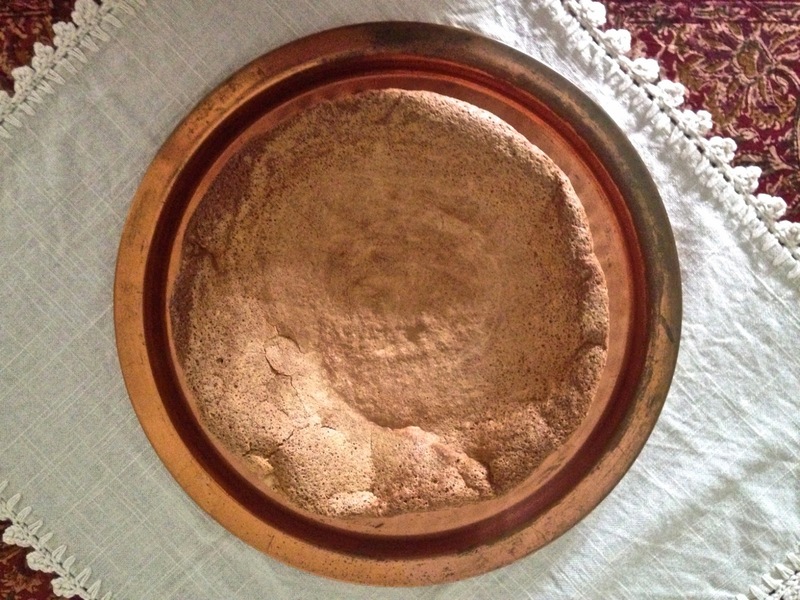 Passover always inspires me to try new flourless cake recipes. This year I wanted to make something classic, simple, and light for seder. This recipe comes from Claudia Roden, the acclaimed author of multiple Jewish cookbooks (among other accomplishments). I served this almond cake with a mix of berries that had been macerated in a little Chambord (raspberry liqueur) and honey. I also served it with whipped coconut cream. The mild creamy coconut goes really well with the subtle almond flavor in the cake... but don't get me wrong, this cake is good all on its own. The cake is crispy and delicate on the outside, and kind of gooey and crumbly on the inside. It makes a really wonderful crackly sound when you cut into it. As it bakes, the top puffs up and as it cools it sinks back down into the cake. 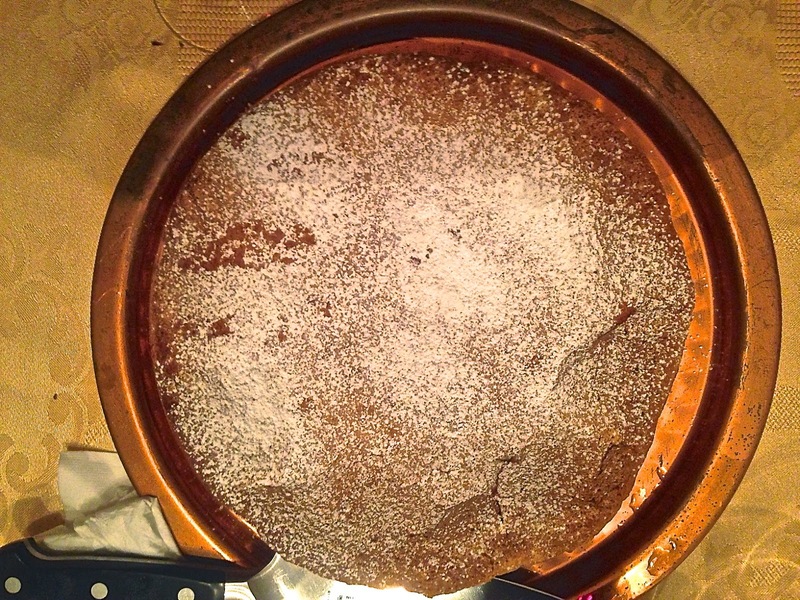 The recipes is very similar to how one makes a flourless chocolate cake. If you do not like the combination of almond and citrus I would omit the zest from this recipe. I think you could also get away with adding other flavorings to the batter (maybe coconut extract, actual coconut, or even cocoa powder/chocolate). The recipe for this cake comes from Spain, and it is perfect for any meal that requires a dessert without flour, dairy, or too much work. Finely grind the blanched almonds in a food processor. Don't grind them too fine or they will start to form a paste. Line a 9-inch springform pan with parchment paper (11-inch works too). Grease the pan really well (I used non-dairy Earth Balance... you could also use margarine, butter, or even coconut oil to grease the pan). With an electric mixer, beat the egg yolks with the sugar until a smooth pale yellow cream is formed. Add the zests and almond extract and beat some the mixture until everything is well-incorporated. Mix in the ground almonds. Using a stand-mixer, electric mixer, or whisk, and using a very clean and dry bowl, beat the egg whites until they form stiff peaks (like you would for classic meringue). Carefully fold the egg whites into the egg yolk and almond mixture. Pour the batter into the greased pan. Bake for 40-45 minutes, or until the cake is firm (no jiggle), and golden brown. Let the cake fully cool in the pan. Just before serving, dust with powdered sugar if desired. The cake actually tastes even better the next day and can be made 1-2 days in advance.